Just off the coast of Naples and Salerno is the island of Capri, which is a fabulous stop for the day. The picture above shows the view of the island as you sail into Capri. The harbor area has shops and restaurants within walking distance. Capri is most famous for their handmade sandals. Walk into any sandal shop, get your feet measured and choose your very own leather straps. Upon arriving in Capri, we boarded a minibus for 15 a minute ride which took us up to the top of the island, known as Anacapri. The bus ride was a little scary as it zipped up the mountain on very narrow roads without any railings. The view from the minibus was beautiful, looking down onto Capri and the Amalfi coastline. On the ride up the windy mountain, you will pass residential areas with large estates and vacation homes, most of which are gated. 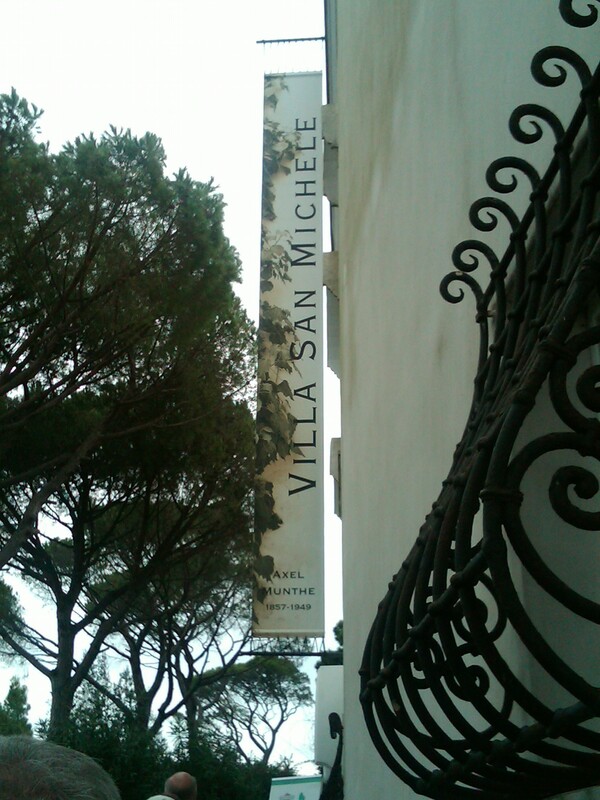 Once we arrived in Anacapri, we took a tour of Villa San Michele. The villa is off white with arches and staircases throughout, open air and had beautiful gardens that you can walk through. My grandmother came along and could walk around at her own pace even though we were on a guided tour. 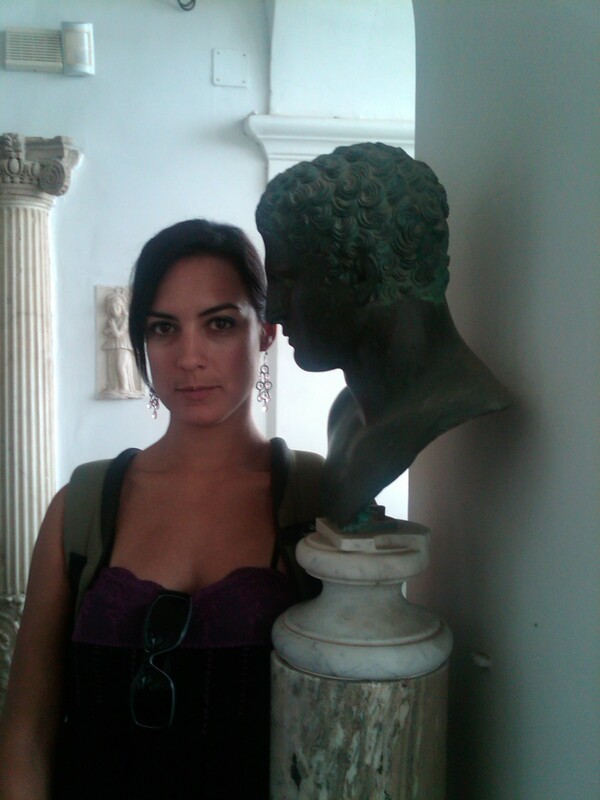 The villa had sculptures and busts about the rooms. The Villa San Michele was built around the turn of the 20th century by the Swedish physician, Axel Munthe, on the ruins of the Roman Emperor Tiberius’s villa, on the Isle of Capri, Italy. Its gardens have panoramic views of Capri town and its marina, the Sorrentine Peninsula and Mount Vesuvius. The villa and its grounds sit on a ledge at the top of the Phoenician Steps, between Anacapri and Capri, at 327 meters above sea level. My sister and I enjoyed thick hot chocolate, almost like liquid pudding consistency in Capri. It was so thick that it rolled down the side of the cup and just hung there! It was rich chocolate that tasted just like you were eating a chocolate bar. Enjoy the Torta Caprese, flourless chocolate and almond cake found all over the island of Capri. 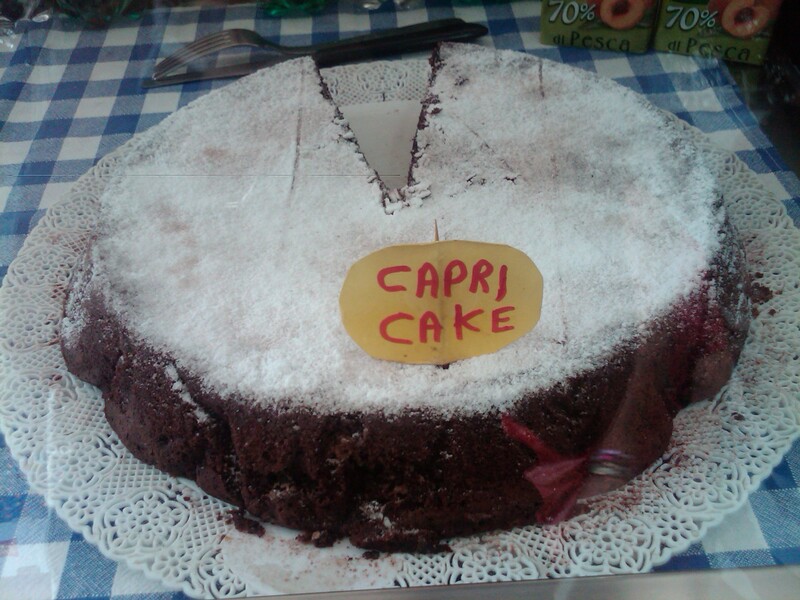 In Anacapri we passed a glass case with desserts inside, the cake with the sign on it which read “capri cake” caught my eye. Slowly melt the chocolate and butter over a double-boiler. In a stand mixer with a whisk attachment, whisk together the melted chocolate mixture, the cocoa powder, almond extract and sugar until combined. Add the ground almonds and whisk until combined. Add the eggs one at a time, adding each egg after the first has been incorporated into the mixture. Pour the mixture into the spring form pan. Make sure the mixture is level and smooth on top. Bake for 50-60 minutes. Cool and serve with chocolate spirals or shavings and powdered sugar. Serve with gelato or whipped cream. 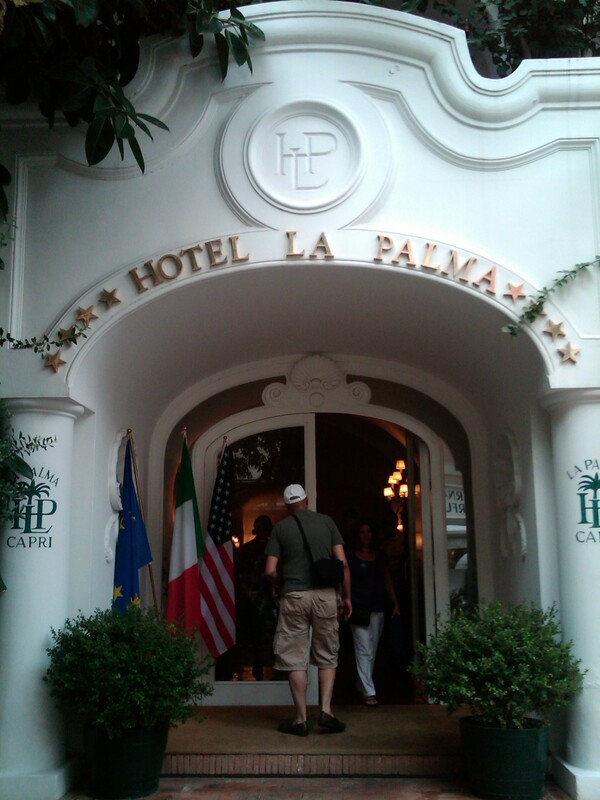 We enjoyed a fabulous, light lunch at Relais La Palma Capri, a restaurant that was nestled into a Spanish style hotel. The lunch ended with a light, lemon panna cotta that was to die for. 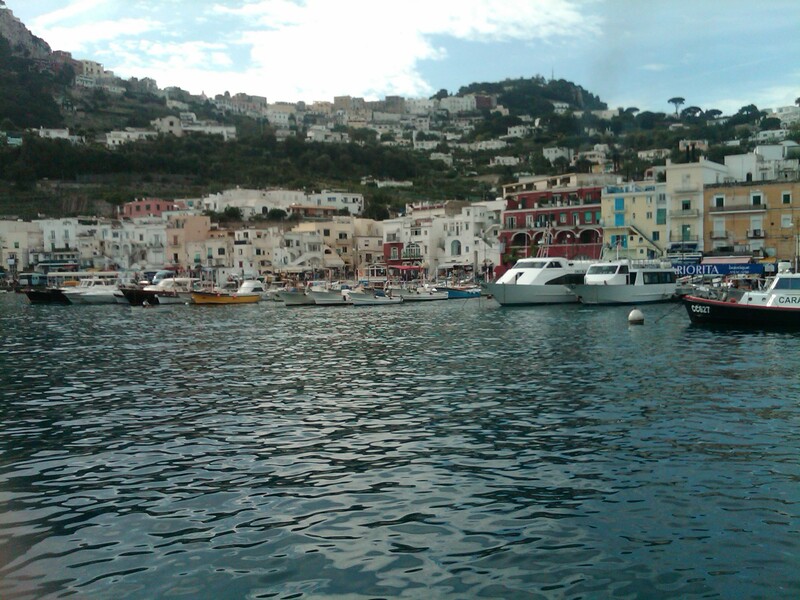 $$ saving tips: Capri is quite small and most of the restaurants and shopping are pricy. Capri is full of high end shops such as Valentino, Alexander McQueen, Dior, Dolce & Gabbana, etc. and I did not see a sale sign. 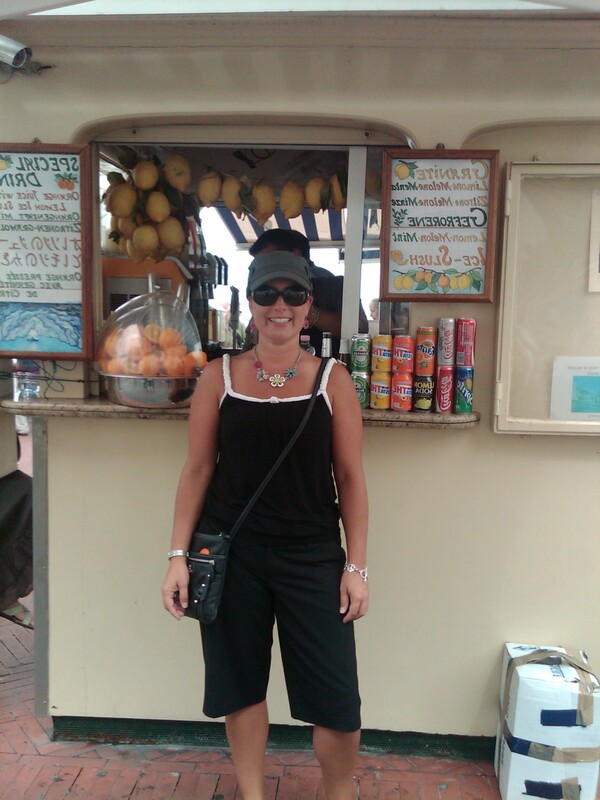 At the harbor there are vendors selling leather purses, wallets, scarves and other souveniers who will barder with you. 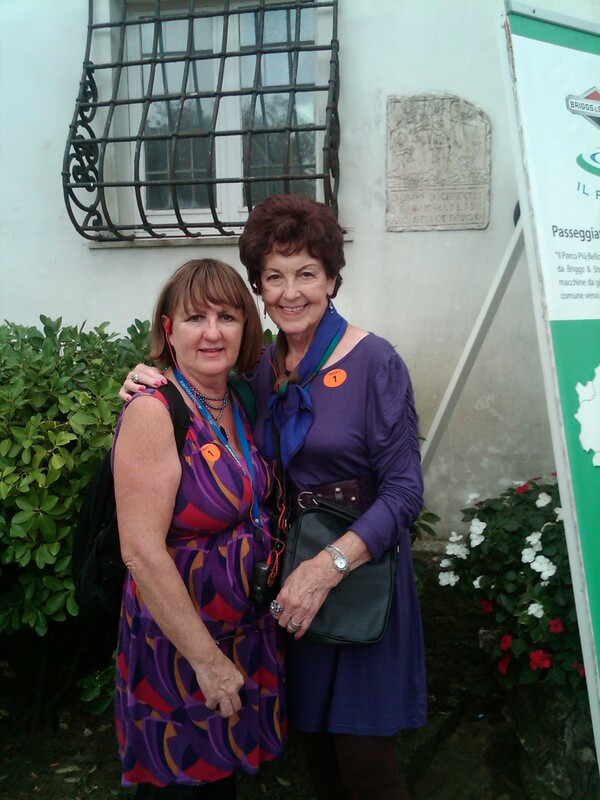 It is a great way to pick up something small as a rememberance of your time on Capri. 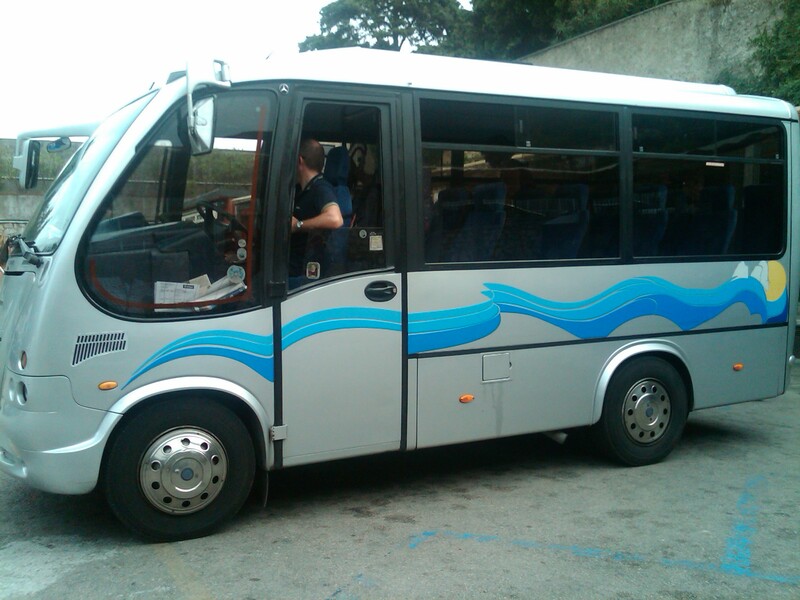 We booked a pre-packaged excursion which included the ferry ride to Capri, a minibus to Anacapri which only holds 12 people, lunch at La Palma Hotel, tour of San Michele and a ride down the Funicular Marina Grande for a reasonable price. Many of the restaurants would not allow a cup of hot chocolate or coffee to go, so we were required to sit and drink it there. Sample your way through the shops in Capri which offer limoncello chocolate, limoncello, or purchase a slice of the famous Torta Caprese, rich hot chocolate or frozen lemonaide. There are ways to experience the specialities of Capri without paying the high restaurant prices. It is a fun place to walk around, explore, people watch, window shop with amazing views of the Amalfi Coastline. The first inhabitants to settle in Capri were the Greek “Teleboi” who came to the island in the VIII Century BC. Today, only the fortified walls of an ancient Greek acropolis still survive as testimony to their presence on the island. In 1906 a local doctor, Ignazio Cerio, uncovered the remains of a number of prehistoric animals and stone weapons during excavation work undertaken to expand the Quisisana Hotel. The great political events that unfolded in Naples with the consecutive rise to power of the Angevin, Aragonese, Spanish and Bourbon dynasties between the VIth and XIXth Centuries, had few repercussions on the island itself. Exposed to the threat of Muslim attack, and left to fend for themselves, the islanders’ best defence was to flea their homes around the Marina and take refuge in the uplands. With few natural resources and a population decimated by pirate raids and pestilence, the plight of the islanders was further exacerbated in the Seventeenth and Eighteenth Centuries by the rivalry that emerged between the island’s two Communes, Capri and Anacapri , regarding their respective civil and ecclesiastic rights of jurisdiction.